Do you know the definition of the 4th industrial revolution? Har du det sorte bælte i forandringsparathed? Disrupt dit lederskab – og nyd turen! 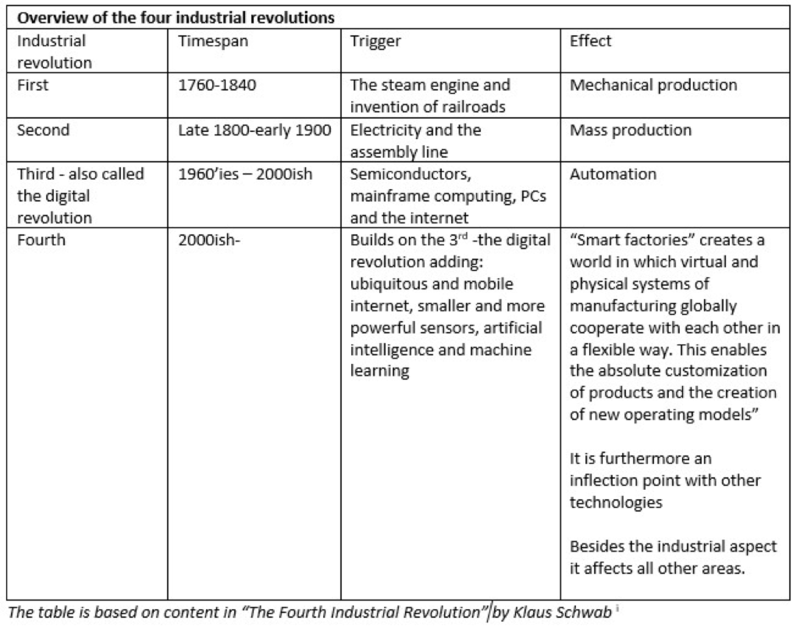 Often when I talk with other leaders, even in the tech world, there is an outspoken lack of clarity about what the definition of the fourth industrial revolution really is. Isn’t is just more of the third revolution with automatization and digitization? It is not. Is the profound and systemic changes in our society, made possible by convergence of the maturation of new technologies and the exponential growth in computational power, digitization, digitalization and digital interconnectedness. The word revolution means abrupt and radical change and the world has changed significantly before. What is different this time is the speed of change. In the third industrial revolution, the core was digital technologies that have computer hardware, software and network. It led to increased automatization, digitization, digitalization (see Appendix 1) – and this revolution is still ongoing. Adding ubiquitous and mobile internet, smaller and more powerful sensors, artificial intelligence and machine learning. The speed of change is faster than ever before – it is exponential or near to. The term industrial revolution is no longer an adequate term as the fourth industrial revolution goes far beyond the industrial sector. We see the new technological developments, new products or new business models, and it is easy to get excited about the technological possibilities. However, the systemic change of our society is an underlying disrupting change of major impact. It will impact everything. It will transform supply chains, production, education, healthcare, transportation, entertainment, regulation, energy supply, water supply, health, learning… It will change way we work, how much we work, how we learn and thrive, how we consider countries or global companies. Its profound changes will change our perspective of what it means to live, be successful and be in this world. It is truly a revolution – a paradigm shift that is underway. It is important to remember that the world is not at an even level in terms of which industrial revolution that has been implemented. Today one cannot talk about which countries are at which level, as a country may have universities and companies working at the forefront of a technology in the fourth industrial revolution, while a large part of the country has not completed the second where electricity is available to everyone, or the 3rd where everyone have access to internet. Singularity University is a private institution which has made it their mark to be at the forefront of knowing the latest about those exponential technologies that can be used to tackle the world’s biggest challenges. They have interest in the technologies that can impact 1 B people over 10 years. 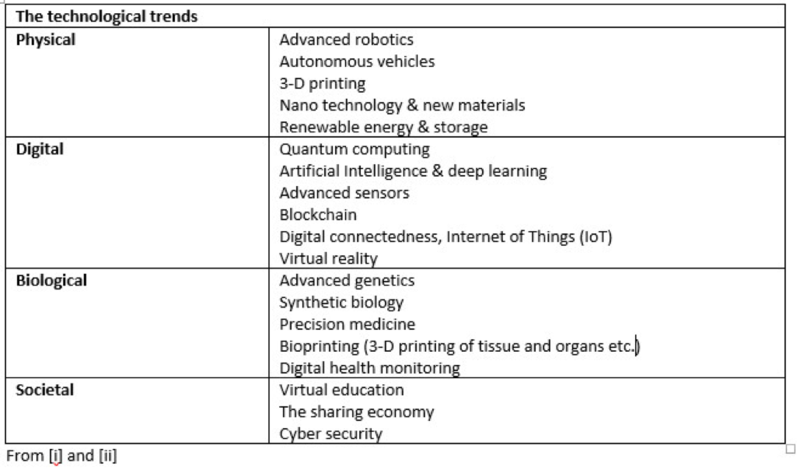 Think about that number for a while – that is a significant ambition – and it also gives the scale of impact that these exponential technologies have. I participated in the Singularity University Global Summit in San Francisco in August 2016. I am a technical literate and already knowledgeably about many of the technologies, yet I was seriously surprised and mentally expanded after two days of examples of what the technologies can do and the speed with which they develop. It is breathtaking, when one understands what the potential and impact and scalability some of these solutions have. Very encouragingly, most of the developments was started from a deep desire to improve life of human beings. These technologies will have impact and many of them will be joined generating even more possibilities. It is impossible to predict which technologies will disrupt what, when and in which way. These technologies enable great opportunities but also great pitfalls and potential negative impact. Klaus Schwab lists both positive and negative impacts of many of the technologies in his book and it is important reading for anyone. Change is the only constant in life. We all need to change with the new era. This change is however of a magnitude and a speed that demands that we think in more holistic perspectives and have much more focus on the life of human beings as well as the foundation for life – the planet, when we develop society and our businesses. This leave us with a huge demand of courageous leaders, who are ambitious on behalf of the common good, leaders who take responsibility for shaping the future, and leaders who can lead in a constantly changing world of possibilities. Humans follow the strong narratives that reach your feelings, heart and soul. Facts are extremely important, but they need to be supplemented with a strong emotional narrative before they really stick with us. The boldest example in newer time is how Americans have followed the narrative of the new American President – a narrative borne out of emotions of fear and lack and fueled with strong emotions towards chosen people or causes – regardless of facts. We must develop strong positive narratives for development of our future. Strong narratives, that do not disregard the downsides while still painting an involving and emotionally desirable picture of the future way of living and working. Our lives will be very transformed and many things we consider fundamental, important and prestigious today will disappear and new norms will develop. Companies too play a crucial role in giving strong narratives for their contribution to the society – the purpose of the company. Digitization refers to the action or process of digitizing; the conversion of analog information (eg. signals, images, sounds and objects) into digital form (i.e. numeric, binary format). The majority of sectors and industries in media, banking and finance, telecoms, medtech and health care have been strongly affected by this conversion of information. Digitalization, by contrast, refers to “the adoption or increase in use of digital or computer technology by an organization, industry, country, etc.”. It is the actual ‘process’ of the technologically-induced change within these industries. This process has enabled much of the phenomena today known as the Internet of Things, Industrial Internet, Industry 4.0, Big data, machine to machine communication, blockchain, cryptocurrencies etc. Finally, digital transformation is described as “the total and overall societal effect of digitalization”. Digitization has enabled the process of digitalization, which resulted in stronger opportunities to transform and change existing business models, socio-economic structures, legal and policy measures, organizational patterns, cultural barriers, etc. [i] Prof Klaus Schwab, The Fourth Industrial Revolution (WEF, 2016). [iii] J. Scott Brennen and Daniel Kreiss, “Digitalization,” in The International Encyclopedia of Communication Theory and Philosophy (John Wiley & Sons, Inc., 2016). Kære leder – har du det sorte bælte i forandringsparathed? Jeg var til et spændende foredrag med Tim Vang forleden. 35 topledere sad og lyttede interesseret til hans kloge ord om eksponentiel forandringshastighed, om hvor anderledes fremtiden bliver om blot få år, og hvorfor det er vigtigt at prøve ideer hurtigt af for at fejle hurtigt – også kaldet pretoptyping – genialt koncept i øvrigt. Men det var noget andet, der skete, der virkelig slog mig. Tim står på scenen og taler ”Der er selvsagt brug for stor forandringsparathed i fremtiden. Er i forandringsparate? ” spørger han ud i salen ”lad mig se en hånd i vejret for dem, der er”. Alle ledere rækker hånden i vejret – for selvfølgelig er vi forandringsparate – vi tænker meget på omstilling til fremtiden, disruption for ikke at tale om at hverdagen er fuld af ledelsesudfordringer, der kræver øjeblikkelig forandringsparathed. ”Godt ”siger Tim ”og så til det næste programpunkt – jeg skal bruge en frivillig her oppe på scenen, hvem har lyst?”. Der var én, der rakte hånden i vejret. ”Se, jeg skal faktisk ikke bruge nogen heroppe, men I har lige taget en test i hvor forandringsparate I i virkeligheden er” siger Tim. For pokker, hvor havde han ret, vi tænker alle, at vi er parate til forandring, og ved også godt, at det er en helt nødvendig ledelsesegenskab, men forandringsparathed kan gradbøjes. Jeg har en grundlæggende lyst til at være i udvikling hele livet, så jeg har altid udfordret mig selv til at bryde ud af min komfortzone. Rejst meget til andre kulturer, taget på mere specielle eller primitive rejser, gået i mod strømmen om at købe villa og stor bil, men også sørget for at udfordre mig i jobskifte med rimelige mellemrum og sågar taget mig udviklingstid mellem direktørjobs. Mr. Facebook Mark Zuckerberg giver sig selv udfordringen at lære én ny ting hvert år – et år lærte han kinesisk. Flere afdelinger i Novo Nordisk går en mindre produktiv tid i møde. Der er en høj pris at betale for at varsle massefyringer i god tid, for virksomheden og for medarbejderne, men sådan er reglerne. Hvad kan man gøre for at få det bedst mulige ud af den frygtsomme periode? 1. TRÆNE MEDARBEJDERNE I AT HÅNDTERE FRYGTEN. Der er altid en vej. Det er vigtigt at huske, at det der sker ikke er definitivt, det er en fase af livet – en fase med en afmålt tidsramme, der nok er ukendt, men typisk 3-12 måneder. Der skal muligvis en træner på, men det handler om at den enkelte visualiserer 2-4 fremtidige scenarier, og systematisk går i detajler med hvert af dem, og smage på godt og skidt. Hvordan ser det ud, hvad er det værste der kan ske, hvad er det bedste der kan ske, hvad er vigtig for mig i mit liv, hvad kan jeg selv gøre. Ved at turde at se fremtidige scenarier i øjenene og udforske dem, så kan man tage handlekraften og handlingsretten tilbage til sig selv i tilfældet af, at der bliver brug for det. 2. KLÆDE LEDERNE ORDENTLIGT PÅ TIL FØR, UNDER OG EFTER FYRINGSRUNDEN. Lederne i store ordentlige virksomheder som Novo Nordisk bliver sikkert behørigt trænet i at gennemføre en ordentlig og værdig fyring. Men bliver de trænet i at lede i månederne inden fyringen? Og månederne efter? Det er nu, der for alvor skal steppes op i lederskabet – hvor en blanding af maskulin og feminin ledelse skal i spil. Maskulin ledelse med klare mål og rammer for de næste måneder, målet med de næste måneder er…”, ”hvad skal vi fokusere på at levere nu er…” men supleret med feminin ledelse: lederen skal også iscenesætte at tale om uvisheden og frygten i afdelingen og give en åben invitation til medarbejderne kan komme og tale 1:1 der ønsker det – mødet kan ikke ændre situationen, men nogle medarbejdere har glæde af at få talt om tingene eller at få noget personlig feedback. Lederne skal tænke i at lede mennersker i denne tid for at 1) holde produktiviteten oppe og 2) få medarbejderne bedst muligt igennem tiden før og efter selve fyringerne. 3. GIV DE FYREDE MEDARBEJDERNE EN MENTAL MADPAKKE MED PÅ REJSEN. Man kan føle sig meget utilstrækkelig efter en fyring. Som medarbejder har du brug for noget, at komme videre på; f.eks. at det ikke handlede om dig personligt, eller kontruktiv feedback om styrker at bygge videre på i fremtiden, f.eks. ved et tilbud fra lederen om at give en skriftlig anbefaling. Mange større virksomheder giver forløb hos en ekstern partner så medarbejderen får professionel hjælp til at komme godt videre. Det ændrer bare ikke ved, at det er den nuværende leder, der hurtigst kan skabe det bedst mulige fundament for at komme videre. Det bør være en hver god leders ambition. Det er en vildt facinerende tid, vi lever i. Fremtiden er fuld af muligheder, og vi kommer ikke uden om disruption. Lige hjemkommet fra Silicon Valley i Californien, en smeltedigel af nye startups, der er i fuld gang med at disrupte den verden, vi kender fra i går. Jeg tilbragte desuden tre dage med Singularity University, der er stedet, hvor viden om den nyeste, fremmeste og kommende teknologiske formåen er koncentreret. Jeg kom dertil med en bekymring for klodens store problemstillinger og gik derfra i lutter opløftet stemning over, at mulighederne ligger foran os. Teknologisk er det allerede – eller er ved at blive – muligt at løse de fleste af de største problemer i denne verden. At frygte eller ikke frygte disruption? Det er opløftende, at et overtal af de nye startups jeg mødte i Silicon Valley er drevet af et mål om at gøre verden til et bedre sted. De tager udgangspunkt i menneskers og klodens problemer og bidrager passioneret med løsninger. Jeg tog på denne rejse med en nysgerrighed på der gik ud på at finde ud af, hvordan vi som mennesker skal udvikle os i den disruptive fremtid. Ultrakort essens: Vi kommer til at leve længere, arbejde mindre, ja i perioder slet ikke have et arbejde. Mange af de jobs som vi kender i dag vil ikke længere være relevante om 10 år, og mange virksomheder vil ophøre med at eksistere. Til gengæld vil der opstå nye virksomheder og nye jobs. Men man spår, at antallet af jobs vil falde relativt i fremtiden. Lige nu kan det for de fleste virke angstprovokerende at forestille sig et andet arbejdsliv. Men fat mod. Det bliver billigere at leve i fremtiden, så du behøver faktisk ikke at arbejde så meget. Der er mange, der på egen krop har følt hvor skønt, det er at leve med mindre arbejde, og have tid til at mærke sig selv. Det bliver desuden nemmere af, at hele samfundets norm om, at ”man kun er noget i kraft af sit arbejde” kommer til at ændre sig til, at ”du er noget i kraft af, at du er dig!”. Jeg tænker at det kan blive vidunderligt. Så kan vi også få tid til at være mennesker igen, interessere os for venner, familie og for andre mennesker i samfundet. Vi kan genoptage de gamle grækeres kulturelle forlystelser, og vi kan nyde naturen og livet. Live and let die. Selvsagt frygter virksomheder for at blive disrupted – altså, at den rolle virksomheden udfylder i samfundet bliver overflødig. 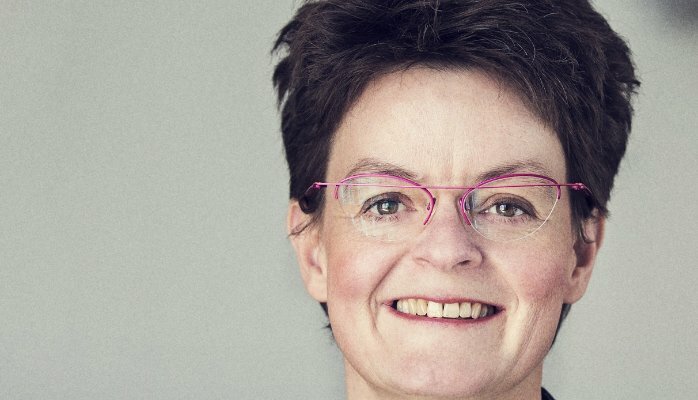 For tiden er disruption ofte drevet af nye virksomheders brug af data og teknologi til at skabe et meget attraktivt alternativ til nuværende ydelser. De har tilmed ofte en helt anden forretningsmodel, som gør, at det er svært bare at tage konkurrencen op. Vi har en forestilling om, at virksomheder skal have et langt og lykkeligt virke. Disruption har den ulyksagelige effekt for en virksomhed, at virksomhedens virke langsomt eller hurtigt bliver overflødigt. Det er ok. Der er ingen naturlov i, at vi har de samme behov årtier efter årtier, så det bør ikke være nogen skam at lukke en branche ned. Det er dog en særdeles vanskelig ledelsesopgave. En lang række virksomheder er derfor gået igang med at disrupte sig selv – bankerne, forsikringsbranchen m.fl. har lavet et samarbejde med iværksættere for at få ideerne og nå at disrupte sig selv, før andre gør det. Dette er efter min mening det mest konstruktive, virksomhedsledere kan gøre i en disruptiv tid. At lede i en disruptiv tid. Disruption er blevet et hverdagsord. Men hvad stiller vi op med det som ledere? At lede disruptive virksomheder er det samme som at skabe fremtiden. Efter at have mødt en del opstartsvirksomheder i Sillicon Valley og i Danmark, så kan man se, at dynamikken er en helt anden end i de større etablerede virksomheder. De bliver ledt på et purpose, et skønt narrativ for, hvad de kan gøre for verden, de bliver ledet med entreprenørånd, co-creation, manglende frygt for egen formåen, åbenhed for andres ideer og erfaringer, med samarbejde og holdånd, ”go-do-it” og med fuld fart ud over stepperne. Startup-virksomheden er drevet i udviklingens ånd. Den corporate virksomhed er drevet i optimeringens ånd. Det giver sig selv, som også mange virksomheder har erfaret og velbeskrevet i litteraturen, at ”startuppen” ikke kan overleve i den corporate virksomhed. Lidt populært kan man sige, at immunforsvaret i den corporate virksomhed dræber ”startuppen”. Erfaringer viser, at det faktisk er en rigtig dårlig ide at indkorporere ”startuppen” i virksomheden – selv når den synes over kritisk masse. Det betyder, at vi kan se for os, at de store virksomheder starter nye selvstændige virksomheder op, der kan disrupte den gamle virksomhed. I stedet for at indkorporere den nye virksomhed, så kan man lade ledere og medarbejdere søge jobs i den nye virksomhed og dermed blive vurderet i forhold til den nye virksomheds behov og systemer. Med mine 20 år i ledelse af teknologi- og videnstunge virksomheder er jeg helt overbevist om, at fremtiden kalder på et ledelsesmæssigt paradigmeskifte til en mere ambitiøs og energigivende ledelse. Både hvis du skal lede en opstartsvirksomhed, en transition eller en gammel virksomhed, så er tiltrækning af de bedste medarbejdere et kardinalpunkt. I det perspektiv er det gamle kriseledelsesparadigme, frygtledelse, siloledelse, micro management og overkontrol helt ineffektivt. Vi kan kun løfte os innovativt ind i fremtiden ved at tænke mere i at lede hele mennesket, at håndtere frygt, at skabe energi og at trække på både de maskuline (blå) og de feminine (rød) ledelsestilgange – dette ledelsestilgang kalder jeg “Det lilla lederskab”. Det lilla lederskab er både ambitiøst på forretningen, målene og resultaterne, og på virksomhedens formål samt medarbejdere og lederes trivsel. Din personlige ambition for dit lederskab. Det er et stærkt udgangspunkt at vide, hvor man selv kommer fra som leder. Hvad brænder du for? Hvad drives du af? Hvad er dit eget livs ”purpose”? Dernæst er det godt at tage stilling til, om du vil være leder eller manager. Forstået på den måde om du vil sætte retning og få folk med dig, eller om du vil løse de opgaver, der kommer af sig selv af at have rollen leder i en virksomhed. Hvis du vælger lederrollen, så tænk over påvirkningen, du vil gøre med dit lederskab, hvad er selve lederskabets kvalitet og mål, sæt ambitiøse mål for dig selv og dine medarbejdere. Bliv ven med din frygt. Vi er alle mennesker og inderst inde bor den bare i os – frygten. Vi har allesammen – allesammen – fået en frygt med os fra barndommen, og den styrer os hele livet, indtil vi omfavner den og slutter fred. Frygten kan drive os til gode resultater, men den kan også forhindre os i at nå resultater, vi ønsker os. Der er en del teknikker til at blive ven med din personlige frygt. Dertil kommer de frygt-drivere, der kommer af frygten for at miste, og de dræner din energi i stor stil. Frygten for at mangle noget, frygten for at miste din egen stilling, din egen præstige, dit eget ego, frygten for hvad andre tænker, og hvad fremtiden bringer. Også disse kan du arbejde med, så du til sidst bliver stort set fri for det drivanker, som frygt er for din energi og dine handlinger. Når du er fri af frygten, kan du tage de bedste beslutninger, have det bedste samarbejde og skabe de bedste resultater. Du kan føle dig fri og levende. Det at turde se frygten i øjnene og lege i tankerne med scernarier om, hvad nu hvis det og det skete, hvad ville det så egentlig betyde, og hvad er det værste der kan ske? At turde tænke disse scenarier er en stor inspiration til at åbne for muligheder, ens egen udvikling og kan være den nysgerrige vej til større mod. Lær at skabe energi. Energi i livet er der masser af. I virkeligheden er der mange af de ting, vi går og gør, der tærer på energien. I udgangspunkt har vi masser af god energi, hvis vi hviler i os selv. Det kræver en indsats at hvile i sig selv, man skal lytte meget nøje til sig selv og sin krop og turde se sin frygt i øjnene. En god måde at vokse på som leder er at blive mere og mere bevist om, hvad der giver en energi, og hvad der dræner en for energi – og så justere sin måde at samarbejde, uddelegere og leve på derefter. Energi er noget der smitter, og derfor er det særligt vigtigt, at du som leder bruger din energi i dit lederskab. Du kan sætte den gode energi igang bevidst, hvis du arbejder med din egen energi og på at skabe energi i situationer. Til at skabe min grundenergi bruger jeg motion, meditation og sund kost som basis energigivere, men jeg bruger også teknikker til at bygge energi op, inden jeg går ind til et møde, skal holde et foredrag eller have en vanskelig samtale. Det er teknikker, der bygger på at visualisere et godt resultat af mødet, uden at jeg nødvendigvis skal sætte ord på et helt konkret resultat. Og så er der den store teknik, der hedder at se verden i et andet lys – eller paraphrasing, som jeg kalder det. Hvis en situation er vanskelig, eller hvis jeg står med en konflikt. Hjælper det at se det i et helt andet perspektiv eller fra den andens synsvinkel. De feminine og maskuline ledelsestilgange. Til en tid hvor ting forandrer sig hurtigt, er det helt umuligt som leder altid at vide, hvad der er bedst. Det handler i stedet om at få medarbejdernes viden, iderigdom, engagement i spil til at løse udfordringerne. Det kræver, at vi som ledere bruger hele os selv – både de ’maskuline’ og de ’feminine’ sider af os. For at få ledelse afkoblet kønsdebatten ridser jeg spillepladen for god ledelse op i farverne blå og rød – samt blandingerne heraf, der giver lilla. Blå står for de maskuline ledelsestilgange, og farven rød står for de feminine ledelsestilgange. Husk maskulin er ikke det samme som mand og feminin ikke det samme som kvinde. Alle mennesker har både maskuline og feminine sider af sig. ALLE disse ledelsestilgange er GODE og nødvendige i god ledelse af en virksomhed. Det afgørende er, at vi fleksibelt bruger dem alle i vores ledelse. Der er ikke én leder, der er mester i alle tilgangene, men til forandrings-processer og til at få medarbejderne med på rejsen, er det afgørende, at alle tilgangene bruges i vores ledelse. Så enten må du træne dem du ikke føler dig på hjemmebane i, eller også teamer du op med en, der supplerer dig på disse områder. I en disruptiv tid har vi alle mulighed for at være med til at skabe fremtiden. For virksomheden og for os selv. Nyd udviklingen! – det er tid til at opgradere ledelse til en digital og hurtig foranderlig verden. Digitalisering og ny teknologi møder os i alle sammenhænge. Tiden vi lever i, som World Economic Forum har benævnt Den Fjerde Industrielle Revolution, vil fundamentalt ændre, hvordan vi lever, driver forretning og agerer i samfundet. De fleste virksomheder har fokus på digitalisering, ny teknologi og disruption, med opmærksomhed på at gribe mulighederne. De færreste har tanke for måden vi leder på under disse forhold. Som ledere skal vi skifte forståelsesramme fra lineær tænkning til eksponentiel og innovativ tænkning. Vi skal bort fra KPI og resultatstyring som det drivende og i stedet se den menneskelige evne til at arbejde i komplekse og usikre sammenhænge som den resultatskabende kraft. Vi skal lede så medarbejderne får mod og energi til at tage ansvar. Det handler om at lede med purpose, reducere frygt, lede det hele menneske from human doing to human being, skabe energi, redefinere succes, skabe agilitet og opbygge mod. Disse ændringer i ledelsesform og organisering er helt nødvendige for at være hurtig og smidig nok til at gribe mulighederne. 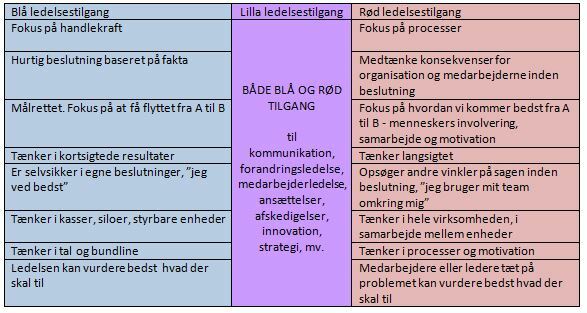 Det enestående er, at de selvsamme tiltag også tackler flere af tidens udfordringer med stress, for lavt engagement, stagnerende produktivitet og ringe repræsentation af kvinder i f.eks. tech og ledelse. I øvrigt kan det nye ledelsesparadigme implementeres på ethvert trin i en virksomheds omstilling fra succes i den lineære tid til succes i den nye æra. De virksomheder, der forstår det, vil overleve og blomstre. Vil du vide mere om Tina Moe og hendes foredrag, er du altid velkommen til at kontakte Tina Moe på 42 43 41 04 eller via tm@tinamoe.dk. Du er også velkommen til at bruge kontaktformularen nedenfor. Send din forespørgsel til Tina Moe. Du får hurtigt svar, og det er naturligvis helt uforpligtende. 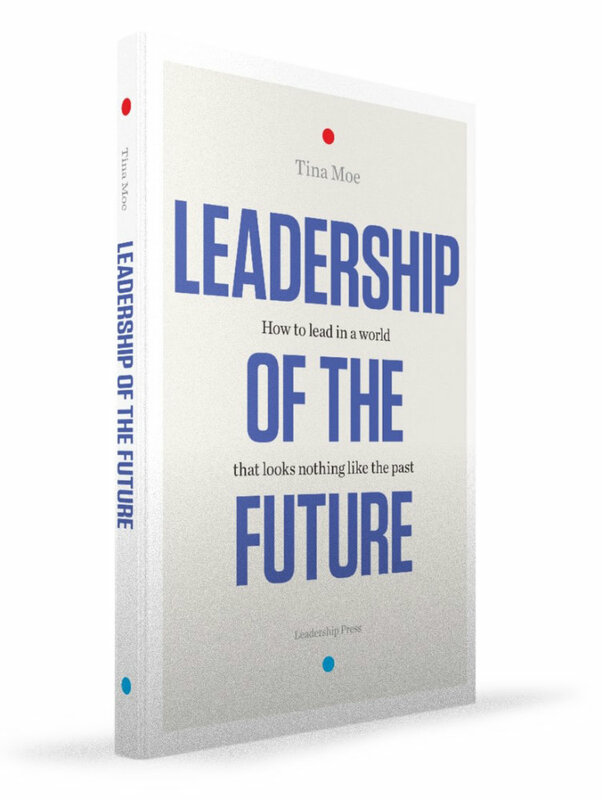 "Leadership of the future - How to lead in a world that looks nothing like the past"
Virksomhedsledere praktiserer ikke en fremtidssikret ledelse, og det styrer deres virksomhed mod afgrunden. Vi skal nærmest gøre det modsatte af hvad vi har været vant til efter finanskrisen for at blive succesfuld i en tid med stigende digitalisering, automatisering og teknologiske tigerspring. Begå flere fejl, skab mere energi og stop det ensidige fokus på bundlinjen. 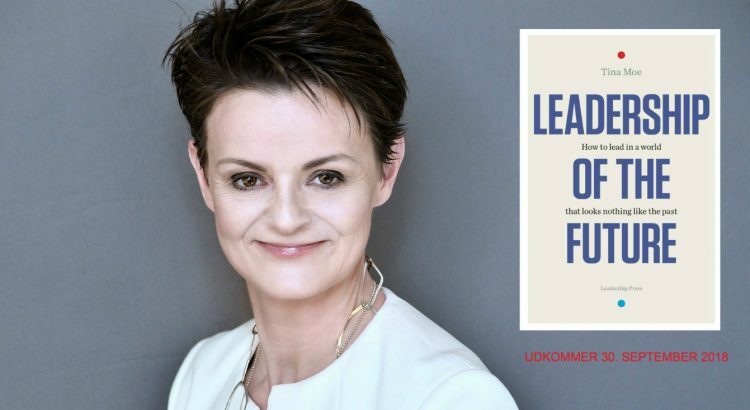 Sådan lyder hovedbudskabet i min nye bog ”Leadership of the Future – how to lead in a world that looks nothing like the past” om grundkernen i fremtidens ledelse.